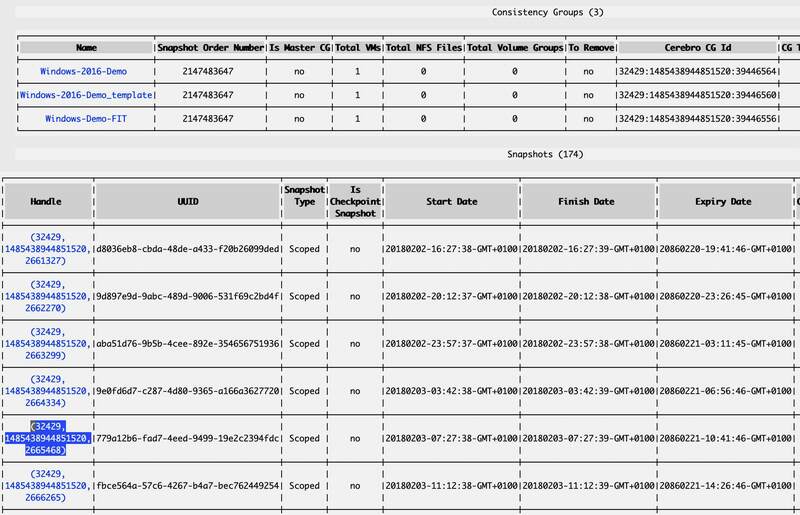 Like with any other hypervisor you can also end up with orphaned snapshots in combination with third-party backup tools on AHV. In general, it is the responsibility of the backup tool to clean up after a backup job run successfully. There can be different reasons why this is not happening and snapshots are left over. To remove these snapshots manually login via SSH to one of the CVMs or the cluster IP address. The following command gives you a list of all snapshots of the specified protection domain, which are flagged with the type “scoped”. Beside the scoped type, which are the hidden 3rd party snapshots, there is a “regular” type for the snapshots which are created manually via PRISM or via scheduler. The trick to get now rid of this snapshot is to modify the expiry_time_usecs value with the following command to the current time, which will get this snapshot expired 1 second later. Replace the <cerebro uuid> placeholder with the snapshot uuid marked in bold in the above example output. This way works great if you have 1 or 2 snapshots, but may you have a protection domain with 100 or more snapshots like I had, which would drive you crazy to do this manually per snapshot. If you have many protection domains, you may want to use the cerebro master page to get an overview over all snapshots. Just run links http://localhost:2020 on the cerebro master CVM (or on any other CVM, which will provide you a link to the master). You may have noted, that on the snapshot next-to-last there is a system protection domain with a long ID as name. Some backup tools out there may use this system protection domain for the snapshots instead of the individual user/regular protection domains. The process to delete snapshots within this system protection domain is quite the same. This name can now be used like in the above outlined steps. Credits to my friend @GuidoHagemann from Nutanix for his help with this!